The semester is over, finals grades have closed, and I’m home for the holidays. For some reason I don’t feel festive until I’m sleeping in my own bed, waking up to decorate and bake with my family. We’ve been catching up- especially me and my sister Emily who has just finished her first semester at college. We’ve spent the last 24 hours singing to the Hamilton soundtrack, eating, and laughing. Emily is normally behind the camera on these posts, but for once, I bribed her to be in the photos. 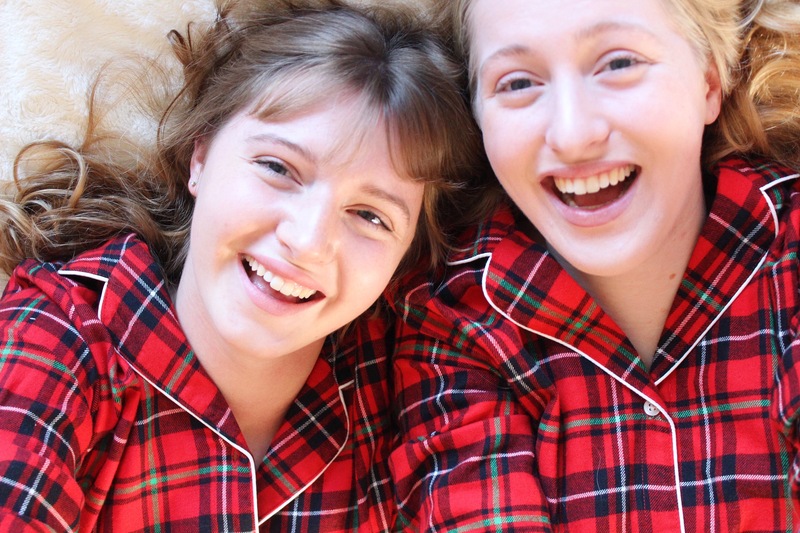 I think that it helped that I got us these awesome matching pajamas from Old Navy to wear. They are so christmassy and comfortable! Also warm, which is perfect because my mom always keeps our house below 70 degrees. I love taking pictures with Emily because she does the craziest things and makes me laugh so hard. The photos that didn’t make it on the blog are even better than the ones above! She definitely brings out my own crazy side; thank goodness for little sisters. As for the photos, I would say we have a few options for this year’s Christmas card. I’ve been thinking lately about how I want to present my blog and what content I want to make. It’s important to me that I post genuine, real life moments that my audience can connect to. Too often I find myself viewing pictures on Instagram or blogs and wondering how true the event behind the camera is. When taking these shots, I found the ones I tried to stage came out worse than the ones where Emily and I were just goofing around. I think that says something. I have some more content coming soon before Christmas and I’m definitely making matching pajamas a new tradition in my family. What traditions are you looking forward to celebrating this holiday season?